After the first initial enquiries about our vocation, the first practical step to discerning whether one is called to become a ‘Tyburn Nun’, is to live-in. Living-in with the community means actually living with the community, sharing its life of prayer in the Divine Office and Eucharistic Adoration, its work, lessons and recreation. The process of living-in gives the aspirant the opportunity to get to know the community in a real way, and the community gets to know her. If the aspirant feels that God is calling her to our way of life then she fills in the application form and writes a letter asking to be received as a postulant. The new postulant lives in the novitiate and shares the daily lessons and work of the novices and joins in the community recreations with them. If after a minimum period of six months, the postulant and the community feel that God is indeed calling her to a life of Adoration and Praise in our Congregation, then she may ask to become a novice. Monastic life really begins when a novice receives our habit and a white veil. The novitiate lessons are designed to help her learn the basics of religious life, and include the Holy Bible, the Catechism, our Rule of Life, and the lives of our founders – St Benedict and Mother Marie Adele Garnier, Liturgical Music, sections of Canon Law and the documents of the Church, especially those relating to religious life. The novice’s spiritual formation continues during the 2 – 2 ½ years novitiate and she learns to serve the community in the different ‘employments’ – the laundry, the kitchen or the infirmary. After her time of novitiate, the novice may request to make her first profession of Benedictine vows which are for three years. 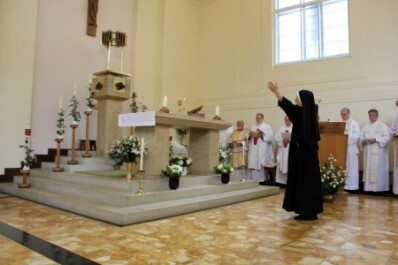 In the beautiful ceremony which takes place during Holy Mass she receives the black veil and medal of the Congregation. Now the sister is called a Junior, and her education in all aspects of our life continues. Doing our Congregation study courses, she begins to write essays as a way of deepening her understanding of the material she is studying. She is given more responsibility in the community work, and continues to seek out God’s will in her daily life with the help of daily auditoria (or meetings) with her superior. All these stages are but preparation for the most important single step any Sister will take in her life: Monastic Profession – when she says an eternal ‘Yes’ to God. It is not a step she undertakes lightly. In the formal ‘questioning’, the sister asks to follow Christ her Bridegroom in our monastic family all the days of her life. Then she prostrates for the singing of the Litany of the Saints asking the help of all heavenly host, especially her own patrons. At this point she reads the formula of profession which she has written in her own hand, and signs it on the altar. Now she begs the helps of God himself, singing three times the ‘Suscipe’ – “Uphold me, Lord, according to your promise and I shall live: let my hope in you not be in vain …” After the solemn blessing the white Cowl is presented, and then the ring. After the kiss of peace, the newly professed Mother (in our Congregation, once a Sister has made her monastic profession she is called ‘Mother’ to signify her spiritual motherhood) brings up the offertory gifts with members of her family – an action full of new significance for her. The written document of profession stays on the altar not only for the rest of the Mass, but all day, after which it is placed in the monastery archives. It is a day of joy not only for the newly professed Mother, and the Congregation, but also for the whole Church.